The 7th Annual “Music, a Menu, and More From Around the World” Fundraiser for the Heartland Symphony Orchestra will feature an arrangement from the Swing – Big Band Era. The afternoon includes a 4-course meal prepared by Tomas, a Cordon Bleu trained chef, paired with musical selections. Join us Sunday, May 5, 2019 at 3:00 p.m. at the A.T. The Black & White, 114 1st Street SE, Little Falls, Minnesota. Tickets may be purchased below or contact the HSO at heartlandsymphony@gmail.com or call 1-800-826-1997. Checks can be mailed to HSO, PO Box 241, Little Falls, MN 56345. Tickets may also be purchased at Great River Arts, A.T. 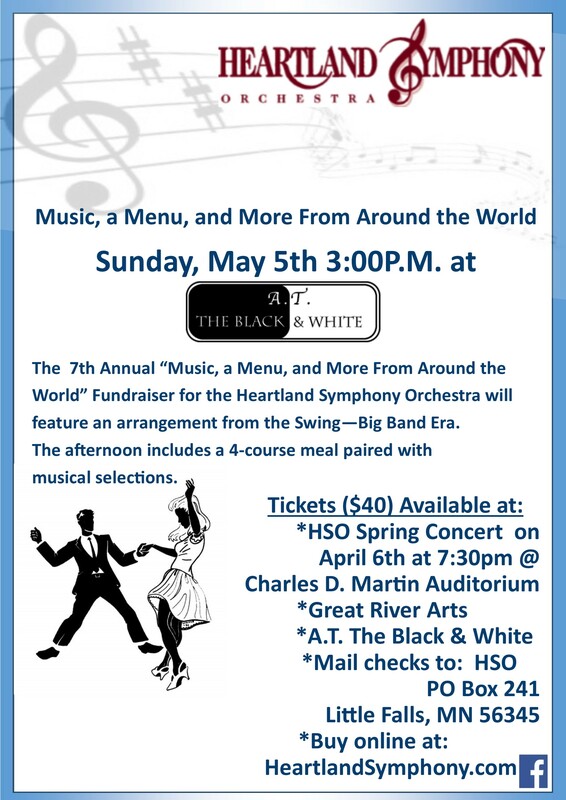 The Black & White restaurant, and at the HSO Spring Concert on April 6 at 7:30 p.m. at the Charles D. Martin Auditorium in Little Falls. View the Music, a Menu, and More From Around the World poster.